(HS171-05) Stunning resort style 5 rai property with mature gardens. (HS114-03) Well-designed, beautiful detached 3 bedrooms house for sale, Pa Pong, Doi Saket. The Doi Saket Properties team are Doi Sakets only profesional real estate agent. We pride ourselves on our relationship with the local community and being able to find stunning land and homes at local prices. Unlike most other agents, Doi Saket Properties does not mark up the price from the seller and will do all negotiations on your behalf to assist in getting the best price on your new property. We will be with you every step of the way to ensure a smooth hassel free land or house purchase from deposit to land title transfer. 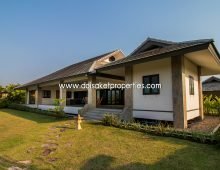 Whether your looking to buy, sell or rent properties in and around the Doi Saket area, Doi Saket Properties is here to assist you every step of the way. Please call us today or visit our office to see how we can assist you. Whether it is helping you search for your dream home, discussing new Doi Saket developments, or assisting with the sale of your property, we would love the opportunity to help. Please feel free to contact us with any questions!